Hero Histories: The Doctor is IN...and he's STRANGE! Initially called "Doctor Strange" scientist Hugo Strange became a superhero in Thrilling Comics #1 by ingesting a substance he created called Alosun, obtained by distilling the atoms of the Sun, which gave him super-strength and near-invulnerability. He couldn't actually fly, but could leap great distances like the Hulk and the Golden Age Superman . But within several months, this became dark jodhpurs, riding boots, and a red safari shirt, which quickly became a faster-to-draw red t-shirt. Again, like Doc Savage, he didn't have a secret identity, so there was no need for a mask, but Strange did have an unusually-large pompadour to give him obvious visual distinction. When kid sidekicks became a trend, Doc introduced Mike, who wore a similar outfit. Reports conflict as to whether Mike received Alsoun or not, and since the Thrilling Comics I've scanned are all slabbed, I have no way of confirming if Mike was super-powered or not. Doc retained the Thrilling Comics cover spot for most of his run, only losing it for two months to the patriotic American Crusader, before regaining it until #60, when a jungle heroine named Princess Pantha replaced him. (Ironically, his final cover on issue #59 showed him rescuing a jungle girl, but not, as reported, Princess Pantha!). Doc stayed as a backup until #65, when he disappeared. But you can't keep a good hero down. The concept proved popular enough that a spin-off book entitled Terra Obscura , starring Tom Strange and his new crime-fighting companion/wife, Princess Pantha (who had replaced Doc in Thrilling Comics!) ran for 12 issues! Doc has also appeared in Alex Ross' Project SuperPowers series, though simply called "Doc", to avoid confusion (and potential trademark conflict) with Marvel's Doctor Strange. 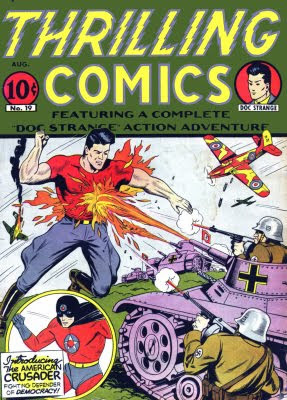 We at Atomic Kommie Comics™ have also revived Doc as part of our Lost Heroes of the Golden Age of Comics™ line! There are four classic covers (including his FIRST appearance) on a variety of collectibles including t-shirt, mugs, messenger bags, and other cool stuff as well as a Classic Doc Strange 2010 12-Month Calendar with a dozen different covers including his first and last! The Doctor is in, and he's ready for action!